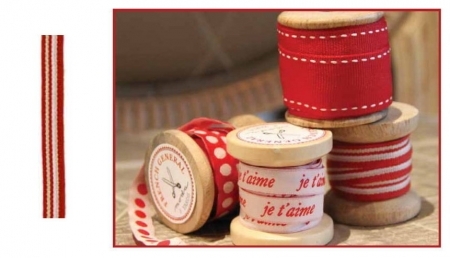 French General Trim 1/2″ Red Beige and White Stripe. 3 yards of the trim shown in closeup on the left side of picture will come packaged on a wooden spool as shown on right. 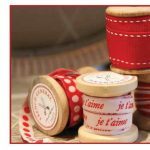 These trims are the perfect or any sewing/craft project and match the Lumiere De Noel Collection by French General. More in this collection in our store while supplies last. Use store search engine to find.